Cairns Colonial Club Reservations. Call 020 7962 9933. The Cairns Colonial Club Resort is set within 11 acres of tropical gardens. 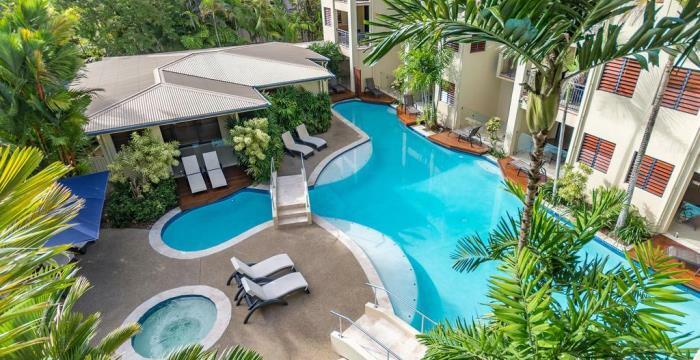 It combines the tranquillity of a tropical resort with the advantages of a mainstream hotel and is one of the most popular resorts in Tropical North Queensland. Cairns city centre is 4km away and the airport is 7km. There are 345 rooms at the Cairns Colonial Club Australia. There are 5 room types available ranging from simple and functional standard rooms to spacious and newly refurbished VIP suites, all on the ground or first floor. The Cairns Colonial Club Resort features 3 lagoon-style swimming pools, a fitness centre, spa and a tennis court. From the laid back and casual Poolside Café, to a great buffet Breakfast, or Steak Dinner at the Homestead Restaurant, there is something for every appetite and budget at the Cairns Colonial Club Resort. Would never do longhaul with BA legroom in economy - it was the same as if you were going to Europe and the food was naff! Thanks to Dylan for suggesting such good hotels and places to go. All went to plan so very pleased! Mitch always finds best flights for me to fly Business Class to Australia - 5 yrs in a row. I was very pleased with the service and friendly manner of Ryan the consultant who supported us. Great trip. All just as you said it would be . Top company, will use again. Absolutely perfect service which made our holiday fantastic. I was very impressed with your service, especially the call I received the day before I left asking me if I needed anything and to have a safe and pleasant journey. It's things like this that stick in your mind and I have already recommended you to some of my family and friends. The only thing that didn’t work at every stage of the journey was the wheelchair assistance. Your help took the stress out of the travel. I have already recommended you to several people and my sister is booking her next flight through you. Very easy to organise our multi stop trip with Harrison and it all went smoothly. I always choose DialAFlight for my flights to Australia. I’ve always found them thorough and helpful. They always listen to my needs and nearly always come up with a good price! You will be our first place to contact for our next trip to Oz. Look forward to next trip. We always tend to book our holidays through DialAFlight, especially travelling far distances. They are great in the planning of our trip and making sure everything runs smoothly. I would highly recommend and will be using them again in the future. Special thank you also to James, who is extremley efficient and helpful. Huge thank you! Your service from start to finish was excellent. Love the app too as it meant we had up to date information on hand when we needed it. Would certainly use again. Spike looked after us and planned the whole trip - we had a brilliant time with no problems.